Most fish species are restricted under ceilings of ice. They get pushed into corners and pockets holding the warmest remaining water. Lake trout are just the opposite. Winter frees them to roam wherever they please. Since lake trout can go anywhere in winter, and being the gluttonous, non-stop predators they are, we find them near the thickest pods of forage fish. Their diet tends to be composed of related species like ciscoes, landlocked salmon, small trout, and whitefish—which are also free to roam wherever they please in winter. As a general rule, ciscoes suspend, while whitefish and those other species alternate between suspending and hugging structure in main-lake areas. So, lake trout often congregate near main-lake structures rising out of relatively deep basin areas. They use submerged islands, humps, reefs and main-lake points to ambush suspended forage drifting by in deep currents. Those same areas allow lakers to access structure-oriented baitfish when open-water species refuse to appear. But, winter lakers can roam around on shallow flats, too. 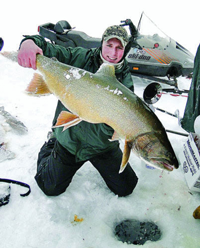 While you’re hooking one in 12 feet of water, someone else could be hooking one suspended over depths of 200 feet or more, which makes locating the forage the key to catching hard-water lake trout. Determine which species are most abundant, determine what areas those fish use the most, and the largest concentrations of lake trout will always be nearby. Lake trout tend to thrive in the most sterile aquatic environments on earth—sterile meaning low biomass, with the least pounds of fish flesh per acre. Yet lake trout grow to enormous sizes. The world record of 72 pounds came from Great Bear Lake above the Arctic Circle—one of the most sterile lakes on the planet. What it all means is this: Lake trout are genetically predisposed to eat anything that moves or makes a sound—anything, that is, that will fit in that prodigious maw. When not spawning, lake trout just hunt and eat. It’s all they can afford to do if they want to maintain such outlandish size in such sterile environments. That makes our jobs easier: Get something in front of a laker and it’s likely to eat it. Since lake trout use the entire water column from right under the ice to the bottom in depths ranging from 5 feet down to about 150 feet, good sonar is a must. If a solid mark appears anywhere in the water column, immediately drop or raise the lure to that level before it swims off. If you can’t see big marks on sonar, methodically fish the entire water column. Drop the lure 10 feet down, work it for a minute or so, drop it another 10 feet and repeat. The best lures for lake trout make noise, create vibration, are easy to see at a distance, and imitate dying or wounded baitfish. Lures like the 1/4-ounce Lindy Rattl’N Flyer Spoon, snapped upward 2 to 3 feet at a time and allowed to flutter back down, attracts lakers three ways: It calls fish from a long distance with noise, it helps them zero in with flash, and it triggers lakers to strike with a natural, free-fall flutter that mimics a dying baitfish. Vibration is another lake-trout nemesis. No trout, in fact, can resist the vibration of a spinner, and the Lindy 360 Jig is a spinner designed for vertical fishing. The 3/8-ounce version falls like a spoon into the depths lakers frequent, which is an absolute requirement. When lifted or jigged, the bladed body spins on a shaft, producing vibration and holographic flash. Dropped to bottom and reeled all the way back to the hole, the 360 can find the levels lake trout are using faster than any lure on the market. Jigged in place, the 360 has the mesmerizing ability to transform lookers into biters. To find lake trout, make holes on top and along the sides of structure, but also well away from it, out over basin flats. Whitefish, one of the lake trout’s favorite food sources, love flats. If nothing is happening near the ice or in the middle of the water column, spend a few minutes pounding bottom at each hole. One of the best lures on bottom is the Lindy Techni-Glo Flyer. The “wings” on the Flyer allow it to glide in a circle when dropped, but they also allow the Flyer to glide along bottom. Drop it, let it circle out away from the hole, and then drop it on bottom. Every time you lift the rod tip, the Flyer scoots right along bottom until you drop it again. Tipped with a live minnow or a white-with-silver-flake soft plastic, the Flyer has that circling action on the drop that lake trout can’t resist—the same circling motion they see every day when stunned or wounded baitfish drop out of a school. All lake trout lures match well with 8- to 10-pound monofilament or fluorocarbon. The added resistance of those lines (compared to super braids) allows lures to create wider circles on the drop. The best rods for lakers on ice are long for ice rods. Choose the models over 40 inches long with some action in the tip to protect knots, but plenty of stiff backbone for setting hooks down deep. 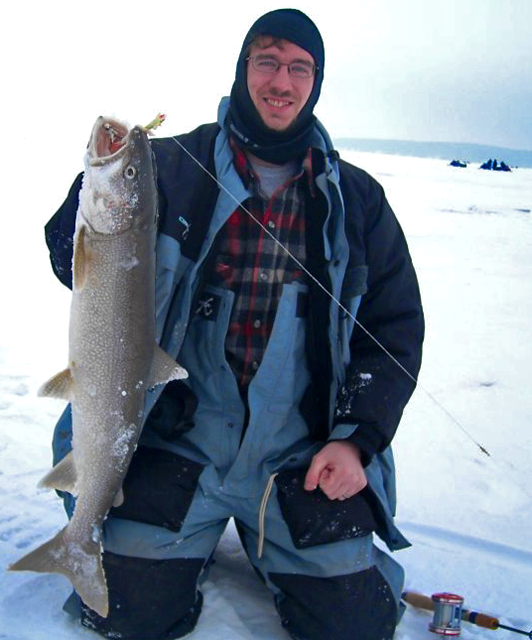 Lake trout are some of the toughest animals encountered by ice fishing. Hook a bulldogging 8 pounder and your arms will tire bringing it up. Hook a 25 pounder and your arms, back, and knees will scream for mercy. Fish fast, cover water, apply the right lures to the situations at hand, and you’ll see. No pain, no gain—but it hurts so good. Since lake trout can go anywhere in winter, and being the gluttonous, non-stop predators they are, we find them near the thickest pods of forage fish. Their diet tends to be composed of related species like ciscoes, landlocked salmon, small trout, and whitefish. While you’re hooking one in 12 feet of water, someone else could be hooking one suspended over depths of 200 feet or more, which makes locating the forage the key to catching hard-water lake trout.